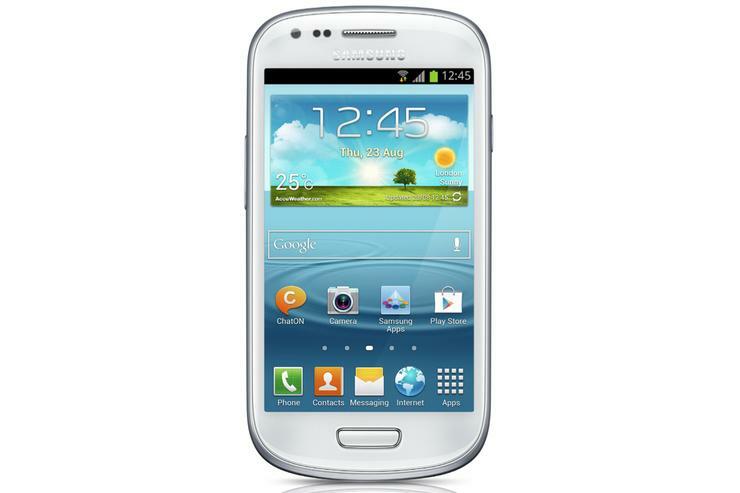 The Samsung Galaxy S III mini is a smaller version of the Galaxy S III in both size and specifications. The biggest change in the Galaxy S III mini is obviously the physical design. It has a 4in screen compared to the 4.8in screen of its larger brother and that gives it a much smaller footprint. The Galaxy S III mini is only 63mm wide compared to 70.6mm and it's significantly shorter at 121.6mm compared to 136.6mm. The compact design means the S III mini will suit users who find flagship smartphones too big. However, Samsung has done well to keep the an identical shape with rounded corners and smooth edges. While the mini is thicker (9.9mm) than the flagship Galaxy S III (8.6mm), the reduced overall size should make it far more comfortable to hold and use. The 4in super AMOLED display on the Samsung Galaxy S III mini has a resolution of 480x800. That gives it a pixel density rating of 233ppi compared to the 306ppi of the bigger variant. The screen obviously won't be as impressive as the the original Galaxy S III and won't be able to display the same crisp text, but as long as the phone is competitively priced we don't necessarily think this is a huge issue. Many expected the Galaxy S III mini to have near identical specs to the flagship model in a smaller package but that isn't the case. Samsung is obviously banking on users who want a smaller phone not wanting the most powerful device. The Galaxy S III mini is powered by a 1GHz dual-core processor, has 1GB of RAM and has either 8GB or 16GB of internal memory. There's also a microSD card slot for extra storage. The downgrades don't end there. The rear camera is 5-megapixels compared to 8-megapixels and the front-camera is VGA compared to 1.9-megapixels. The rear camera will record HD video up to 720p whereas the flagship Galaxy S III supports full HD 1080p video recording. Perhaps the best aspect of the Galaxy S III mini is its software. It will come with the latest 4.1 Jelly Bean version of Android out of the box and will once again feature Samsung's TouchWIZ UI overlay on top. The user experience appears to be identical to the regular Galaxy S III with the same "inspired by nature" theme, though it remains to be seen if all of TouchWIZ's features will make it across to the mini. The lesser technical specifications are likely to mean that features like 'pop-up play', where a video can be running in a small window on the screen while you use other applications, may not be supported. The Samsung Galaxy S III mini is a 3G device, but it doesn't have LTE 4G connectivity. Therefore, it won't work on the 1800MHz 4G networks used in Australia by Telstra and Optus. Samsung hasn't yet announced pricing or a release date for the Galaxy S III mini and Samsung Australia hasn't confirmed whether the phone will be sold Down Under. "Samsung Electronics Australia is pleased there is interest about the Galaxy S III mini in Australia, but we are unable to make any announcements at this time."